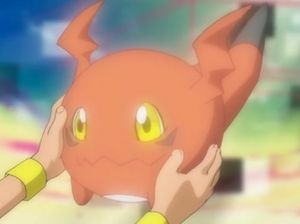 A four-legged Baby Digimon that grew from Jyarimon. 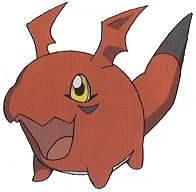 Its physical features resemble those of Tokomon, and there are powerful fangs growing within its mouth. However, unlike Tokomon, who evolves into the Mammal-species, Gigimon, who evolves into the Dragon-species, has a rough personality, and is ferocious despite its small size. There are more than a few even larger Digimon that were deceived by its appearance and suffered a counterattack. Its Special Move is snapping at the opponent (Hot Bite). Its temperature is hot like with Jyarimon, and it is said that it burns the things that were bitten. Attacks with a burning bite. Gigimon is the partner of Matsuda Takato. 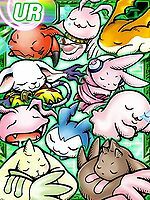 In the last episode, most of the partner Digimon were reverted to their Baby II forms and taken back to the Digital World. 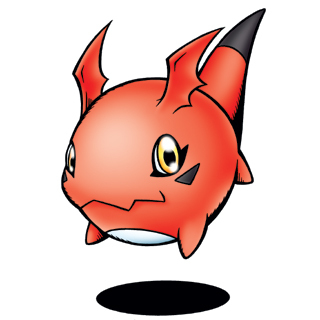 Can be chosen as one of the three partner Digimon from the beginning of the game. Evolves to Guilmon at level 11. Can be found at Task Canyon. Can evolve to Guilmon if above level 11 and already befriended Guilmon. 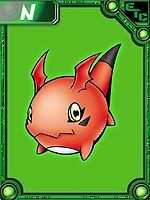 Gigimon is an obtainable Digimon which is evolved from Jyarimon, and can evolve to Candmon, Guilmon, Hagurumon, Pico Devimon, or Tentomon. It can also be obtained as a collectible card. 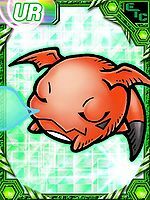 Gigimon is available as a Digimon Medal. Evolves from Jyarimon. Can evolve to Agumon, V-mon or Guilmon. This page was last modified on 25 January 2019, at 20:07.